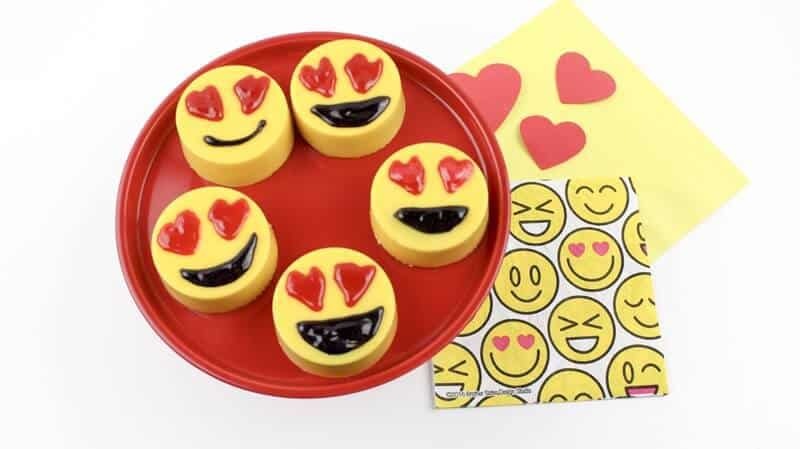 These adorable Heart Eyes Emoji chocolate covered Oreos make the perfect Valentine's Day treat! They are seriously almost too cute to eat! 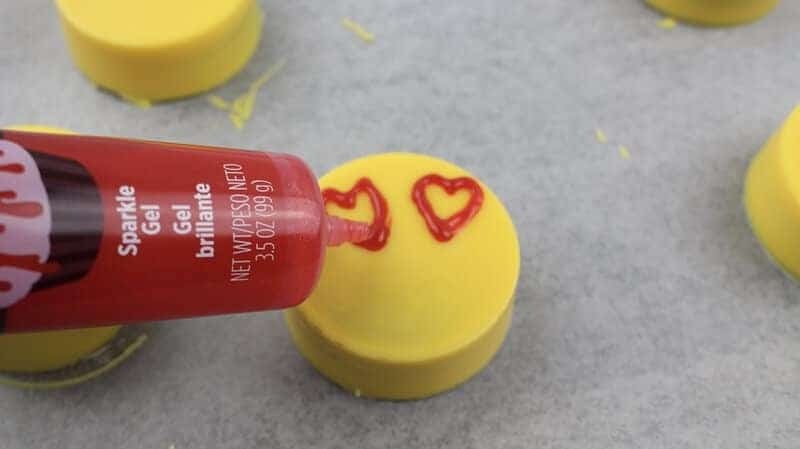 With Valentine's Day just over a month away, I know we are all thinking about what cute treats we can make for Valentine's Day. 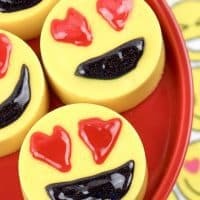 These chocolate covered OREO cookies are made to look like the super popular Heart Eyes Emoji, making them the perfect Valentine's treat. Plus, these cutie pies are actually super easy to make, as long as you have the right supplies. 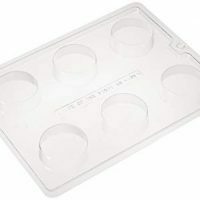 Start by lining a cookie sheet with wax or parchment paper and setting aside. 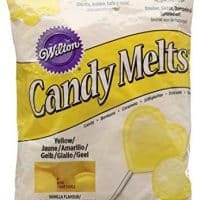 In a medium microwave-safe bowl, microwave the yellow candy melts for 45 seconds. Remove from the microwave and stir. Continue to microwave in 10 second increments, stirring in-between, until melted and smooth. 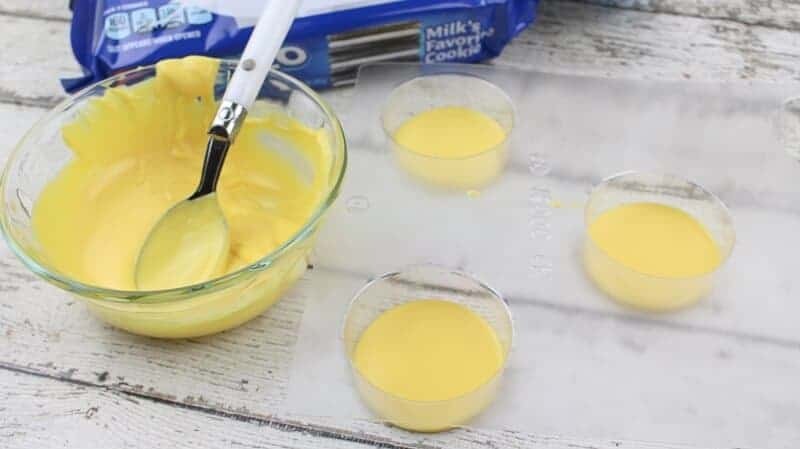 Fill each cookie mold with 2 tablespoons of the melted yellow candy. 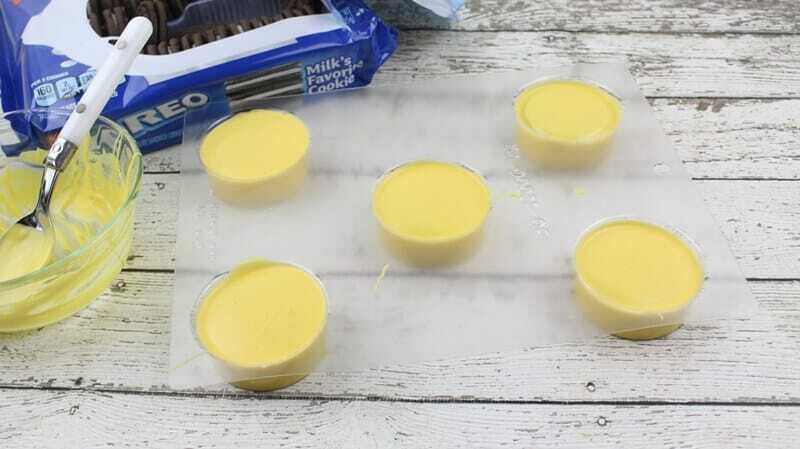 Next, place an OREO cookie in each mold. 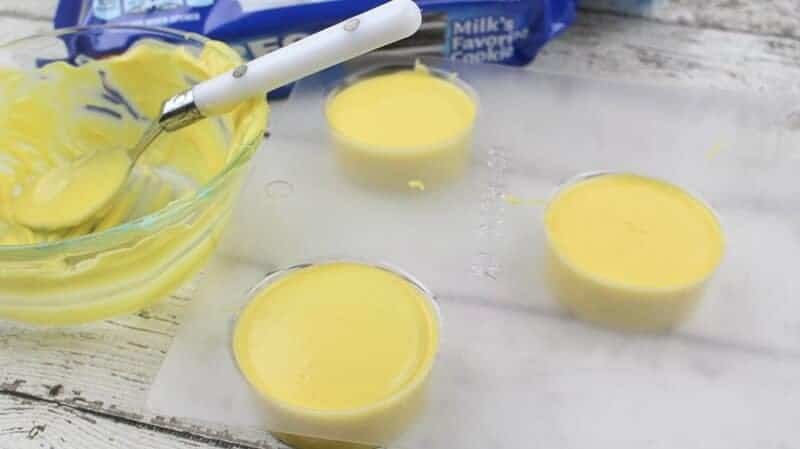 Then, spoon some additional melted yellow candy on top of the cookies, up to the top of each mold. Chill for 30 minutes to allow time to harden. Once chilled, gently pop each cookie out of the mold and place on a lined cookie sheet. With the red decorator icing, draw 2 heart eyes on each cookie. 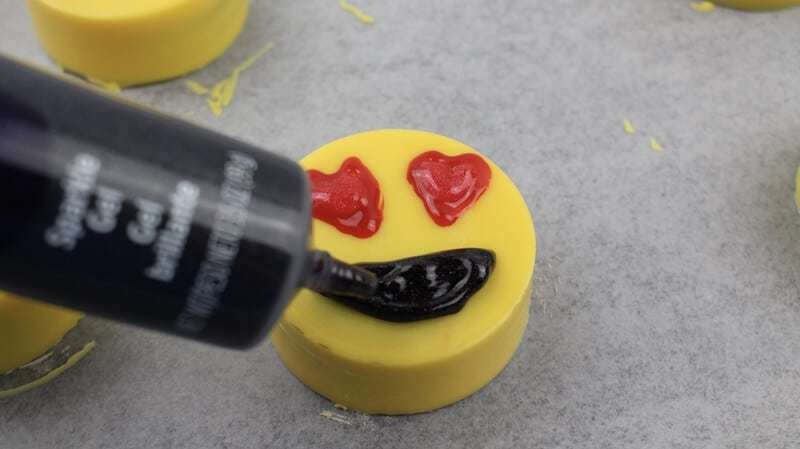 Finally, add a smile with the black icing. Feel free to experiment with different shaped smiles to get your ideal look. That is it – you are done! I told you these were easy to make. These cuties can be stored in a single layer, in an airtight container for up to 2 weeks. 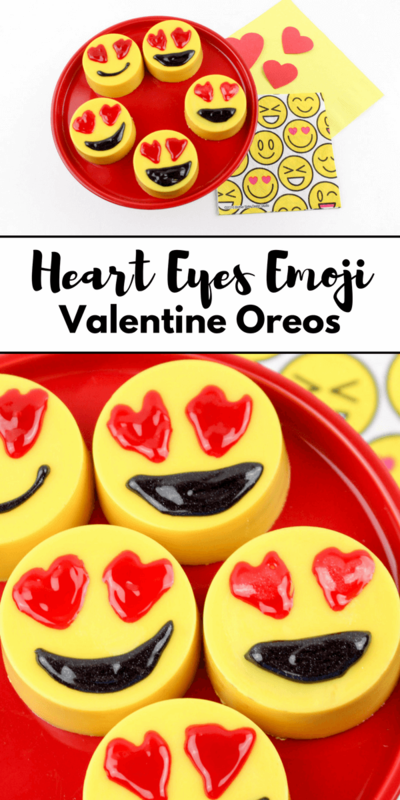 If you like these emoji oreos, you will love our heart-shaped stained-glass cookies as well, so be sure to check them out too. Enjoy the these adorable chocolate covered OREO cookies and have a very happy Valentine's Day! 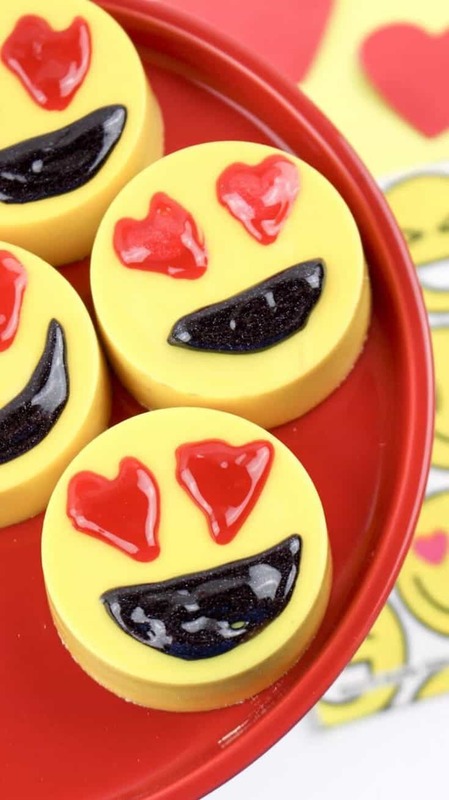 These adorable Heart Eyes Emoji chocolate covered Oreos make the perfect Valentine’s Day treat! They are seriously almost too cute to eat! Line a cookie sheet with wax or parchment paper and set aside. In a medium microwave-safe bowl, microwave the yellow chocolate melts for 45 seconds. Remove from microwave and stir. Continue to microwave in 10 second increments, sitting in-between, until melted and smooth. 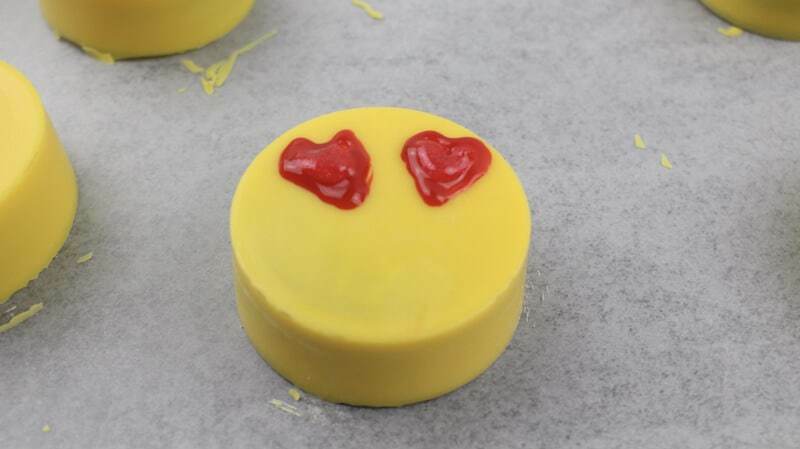 Fill each cookie mold with 2 tablespoons of the melted yellow chocolate. 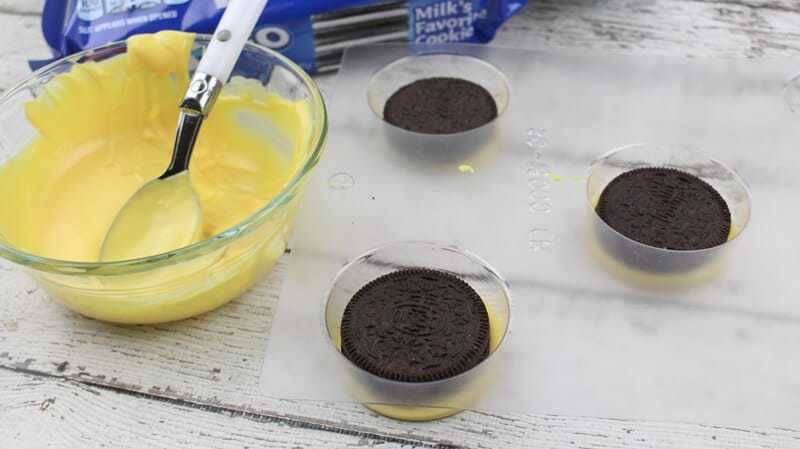 Place an Oreo cookie on top and then spoon additional melted chocolate over the Oreos, up to the top of each mold. Chill for 30 minutes to allow the chocolate to harden. Once chilled, gently pop each cookie out of the mold and place on the lined cookie sheet. With the red decorator icing, pipe 2 hearts for the eyes of each cookie. 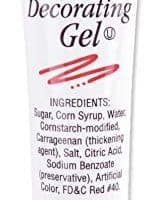 Store in a single layer, in an airtight container for up to 2 weeks. This recipe was definitely pin-worthy!! Emojis are everywhere! My granddaughter even went to an Emoji birthday party. These cupcakes would have been perfect for that party! Yikes, these are so cute! We’d have so much fun making these! These are adorable.. I have to try and make these for my grandson!! I think the grand kids will love these! These are really cute and look easy to make??? These are so cute! My grandson would love them. So cute!! My kids would love these!! I love this- this will be my new Valentine’s cookie! Kids would love eating and making these. 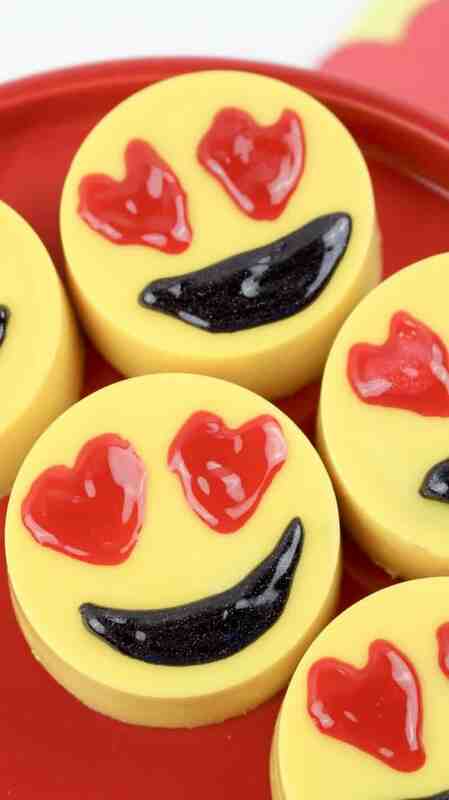 I would definitely would love to try the Adorable Heart Eyes Emoji Valentine Oreos. I think it is a great plate, of which it’s on my menu later in the week. What adorable cookies,tasty looking too. I love Oreos. This is great for Valentines Day. 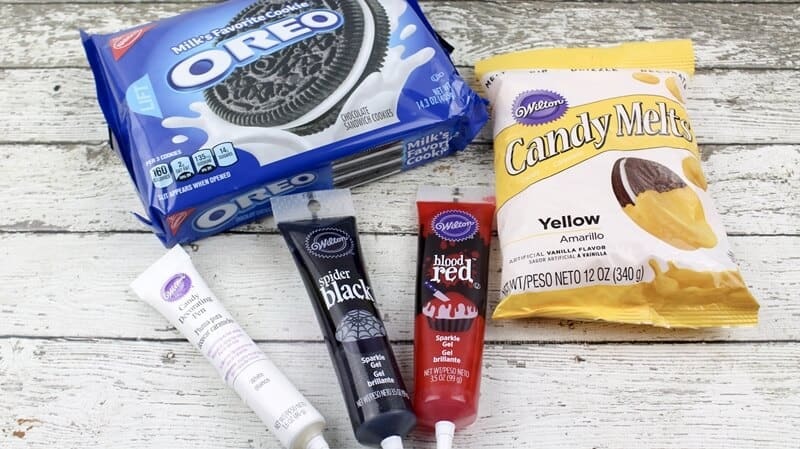 I love eating different kinds of tea biscuit cookies like ginger,coconut or chocolate chip but out of all I like to eat oreo cookies.I’m glad this recipe contains oreo cookies.Definitely gonna try and give my opinion.